Vault offers electronic and manual coin counters and coin sorters/counters for small and medium volume applications. Contact us for details with our contact information below. Sort Pennies, Nickels, Dimes and Quarters with compact color-coded, inter-locking trays. Pour coins into stacked trays and shake. Packaged per set. Count Pennies, Nickels, Dimes and Quarters with color-coded molded plastic tubes in ABA colors. Use Coin Tubes with Gunshell style and Flat style Coin Wrappers. Count of coins can vary due to thickness changing due to wear of coins. 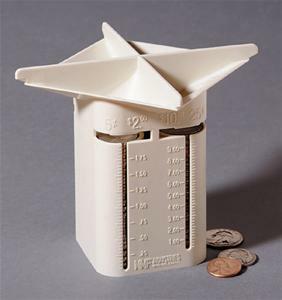 Coin Counting Holder stores, counts and wraps Pennies, Nickels, Dimes, and Quarters in one combination holder. The amount of coin for each denomination can be read by display markings on holder. For wrapping a denomination when full, CoinGates secure the other three denominations so no spilling of coin. Coin count may vary due to coin thickness. Coin Tender sold individually. **Additional Coin Counters and Coin Counters/Sorters are available, for details use the Contact Us tab on our website or contact Roger Zavodny directly by e-mail at roger@myvaultllc.com or by phone at 440-346-4593.